The People Carrier category is one that encompasses vehicles that are essentially passenger cars that can seat more than five people. While this segment proved very popular in other markets, it failed to find adherents in North America and is fast losing ground overseas as buyers clamour for vehicles with SUV styling. 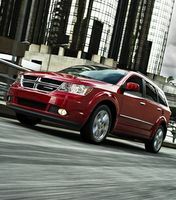 The only real sales success in this segment is the Dodge Journey, which has always marketed itself as a crossover, and sells in large numbers. With no new players on the horizon and no signs of replacements for the current people carriers, this segment will likely disappear over the next few years. A note about mileage: The APA is once again using the Canada EnerGuide test figures as they were available at the beginning of the 2017 model year. 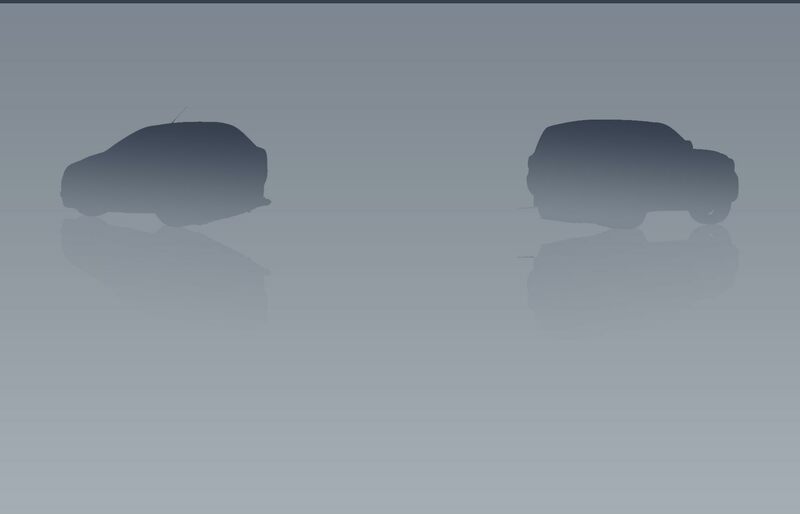 The R/T and Limited trims have been replaced by an all-wheel drive GT model. The 3.6L-V6 is strong, smooth and works very well with its six-speed automatic transmission. The 2.4L four has enough power to move the Journey at a reasonable clip, but except when cruising, the engine sounds harsh and wheezy. Good ride and handling for a vehicle of this type. The steering is nicely weighted but a bit numb. Elegant dashboard with clear gauges and logical controls. The cabin is carefully assembled from attractive components. Cabin space is ample in the first two rows, but the third row is meant for the small and agile. The second and third row seats fold to reveal a long, regularly-shaped cargo bed that is deep below the window line. Cargo space is tight when the third seat is up. Two engines, a 2.4L four and a 3.6L-V6 are offered on front-wheel drive Journeys. Transmission choices are a four-speed automatic with the 2.4L and a six-speed automatic with the 3.6L V6. All-wheel drive is offered only with the V6-engined models. Even though the 17,000 Journey's sold 2016 made it the best-selling vehicle in this segment, sales were down a staggering 9000 units from the year before. Very low MSRP with the Value Plus package. The SE Plus trim is very expensive considering what you receive and the price jump from there to the SXT is a bit pricey even though it includes additional equipment plus the smooth, punchy V6. All-wheel drive, standard on the GT, is a staggeringly expensive $4100 option on the Crossroad trim. Three-row seating is standard except on the base SE trim. Swift depreciation, especially on heavily-optionned models. Good lease value for 2017. Below average reliability on 2009-2011 models. Unproven 3.6L V6. Rapid brake wear on earlier versions of the Journey. Flex: The BlackBerry designed Sync3 infortainment interface replaces the previous Microsoft supplied units. MKT: No changes of note. The strong base V6 in the Flex moves the car with authority but the EcoBoost Turbo delivers astonishingly rapid acceleration without any drama. Both engines are well-matched to the smooth, responsive six-speed automatic transmission. Compliant suspension, stable handling and nicely weighted steering make the Flex a pretty agile bus that excels on long highway runs. The dashboard has clear gauges and a logical centre stack arrangement. The rest of the cabin is very chic and nicely finished. The Flex features comfortable seats, and legroom is abundant in the second row and reasonable in the third row. All who travelled in the Flex were charmed by it, with middle row passengers feeling especially pampered. Unlike many three row people carriers, cargo space is quite good with the third-row seat up, and expansive when the second and third-row seats are folded. 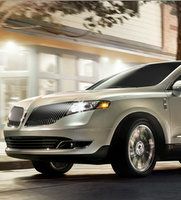 The Lincoln MKT is a smoother, quieter, more luxurious version of the Flex. The Flex and MKT are built on the same Volvo-derived platform that also underpins the Taurus and Explorer. Considering they are both quasi-suvs built on the same component set, Ford has done a good job at differentiating the Flex from the Explorer. Except for towing capacity, the Flex, with more second-row legroom, a much more elegant cabin and easier ingress-egress, is a much nicer vehicle than the Explorer. Despite their inherent goodness, neither the Flex nor the MKT has been embraced by the public, with the Ford selling roughly 2600 units in 2016 and the Lincoln, a meagre 102, not enough to justify its being on sale. .
Flex: All-wheel drive, standard on the Limited, is a $2000 option on the SEL and not offered on the SE. The cost to upgrade from the SE to the SEL is signficantly overpriced for what your get but the Limited is reasonable value compared with an all-wheel drive SEL. At $6800, the turbo V6 engine is an outrageously expensive option. Poor lease value for the Flex. MKT: All-wheel drive and the turbo V6 are standard on all MKTs. 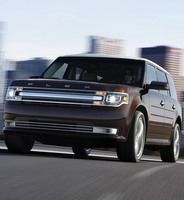 Fully loaded, the MKT is roughly $6000 more expensive than a similarly-equipped Flex turbo. Poor lease value for the MKT in 2017. Not rated due to insufficient sales. Unproven turbo V6. A Ford extended warranty is recommended if you plan to keep your car past the warranty period. Active Safety Features: Available blind spot and rear cross traffic warnings. Available adaptive cruise control with collision mitigation and brake support. The delayed 2017 model finally arrived in the winter of 2017. Mid-cycle refresh with a new front fascia and headlamps and a restyled rear bumper and taillights. The Premium trim level features blind spot monitors for 2017. Revised trim packages. Like other Schreyer-era Kias, the Rondo displays an elegant form, especially for a monospace vehicle. The conservatively-elegant cabin is fronted by a dashboard housing large, crisply-marked gauges, straightforward controls and attractive two-toning. 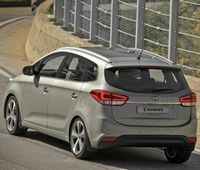 Five and seven seater versions of the Rondo are available. The sole engine offered is a 2L directed-injected four that produces 164 horsepower. Power reaches the front wheels via either a six-speed manual or a six-speed automatic transmission. Luxury features such as xenon headlights, ventilated driver's seat, heated rear seats, heated steering wheel, Keyless Go and a panoramic sunroof, are all offered on the Rondo. With around 2000 Rondos sold in 2016, sales tumbled about 40 percent. The Rondo shares mechanical elements with a variety of other Kias so a mechanical failing in the U.S. should be easily rectified, but a vehicle disabling collision would be a problem as there are no body parts or collision experience with the car there. The $23,095 base L model is nicely equipped, but the $24,595 LX, with features like alloy wheels, rear parking sonar and a roof rack, contains the features most buyers are looking for and is very good value. Those wanting three rows of seats will have to be satisfied with the equipment offered by LX, as it is the sole seven-seat variant offered. The EX trim upgrade, with heated steering wheel, leather seating and Keyless Go, is an absolute bargain, as is the EX Premium trim. 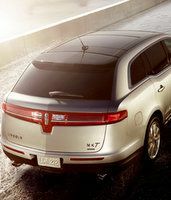 The EX Luxury is comprehensively equipped but is no bargain, with its pricing reflecting the value of its additional content. Poor value leasing is not worth considering . Above average reliability is predicted. 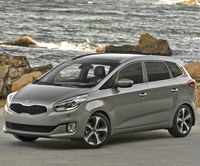 While the Rondo is not sold in the U.S., it shares commonly used Kia components and service should be available in the event of a mechanical problem. Five year/100,000 km warranty. No changes of note for its sixth, and likely last year on the market. 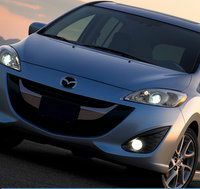 Mazda is trying to remake itself as a premium carmaker and is changing its market focus, including less discounting and higher transaction prices. 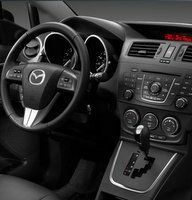 The Mazda's smooth, quiet and sonically fizzy 2.5L four is carefully matched to a responsive, sweet-shifting five-speed automatic transmission. Except for a bit of controlled lean in curves, the 5, like the previous-generation Mazda 3 it is based on, is a very nice car to drive. Precise, nicely-weighted steering. Supple ride with little suspension noise. The brakes are hard to modulate and lack initial bite when the pedal is pressed. Clear, crisply-marked gauges are located in a dashboard that looks good, but is not as functional as it appears. Overly-complex climate and audio controls, and their readouts, crowded into a brow at the top of the dash, lack clarity. Matte-finished hard cabin plastics look elegant and interior assembly is impressive. The six-seater configuration (three rows of two seats per row), limits versatility as you cannot welcome five people and a large amount of luggage at the same time. Very comfortable bucket seats in the first two rows. Legroom is limited for tall drivers and is just adequate for second-row passengers. The third-row seats are for kids only. All 5's are powered by a 2.5L four that sends power to the front wheels via either a six-speed manual transmission or a five-speed automatic. With around 1600 sold in 2016, Mazda 5 sales plummeted roughly 40 percent last year, perhaps signalling the impending demise of this segment. The price of the GS model with the Convenience package (Bluetooth, alarm system, leather steeing wheel wrap and cruise control) is priced to reflect the value of its content. The Moonroof package offered with the convenience package is a bit of a bargain. The GT tirm upgrade, which includes leather seating, is very good value. However, the GS with the Convenience and Sunroof packages provides the most desirable of the GT features for about $2200 less. Leasing is acceptable value this year. Average reliability predicted. Premature rear suspension strut wear is a possibility. An oil or greased based anti-rust compound is recommended as the previous 5 was rust prone.